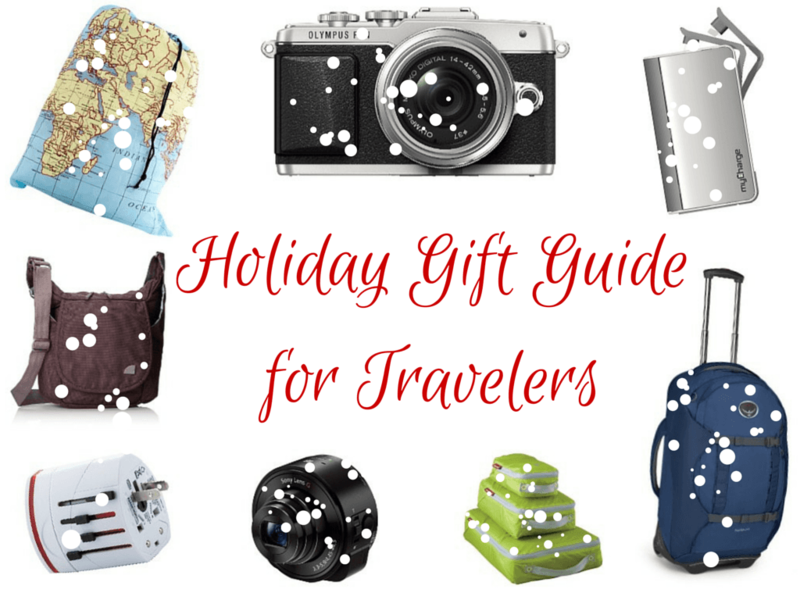 Akatuki’s 2014 Holiday Gift Guide for Travelers – PLUS a Giveaway! 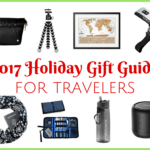 Home » Blog » Travel Tips » Akatuki’s 2014 Holiday Gift Guide for Travelers – PLUS a Giveaway! These days, I NEVER travel anywhere without my Kindle. My device of choice these days is the , which is small and slim, and comes with a backlight so you can read in dim light or in the dark — perfect for planes, hostels, or even camping! I got this for my birthday this year, and have had some fun with it so far. You can clip it to your smartphone to turn your phone into a camera, or you can put it on a “selfie stick” to take photos of yourself on your travels. The lens communicates with your phone via a built-in wifi network and a special app, meaning it just needs to be somewhere near your phone in order to work and transfer the photos into your photo gallery (though you can put a memory card in it and just use it on its own, too!). Considering how much I use things like my phone, Kindle, and video camera when I travel these days, having a battery backup is key. I picked up a earlier this year that charges just about everything — meaning I can throw it in my purse along with a cord or two and not have to worry about running out of juice on my adventures. I've become a bit paranoid about losing photos and video clips when I travel, so last year my boyfriend bought me a – a 1TB hard drive that can handle the bumps and bruises of travel and still hold up great. I've been rocking an for the past year now, and let me tell you — I LOVE this camera. It's small enough to fit into the purse I usually take traveling, lightweight, and extremely versatile. You can buy interchangeable lenses for it (along with the kit lens, I also have a ), and manually adjust all the settings. My friends who travel with bulky DSLRs are often jealous of this camera. However, this is an older model, and it's difficult to find it online anymore. If you're interested in a similar model, check out the or . These are slightly smaller than the E-P2, but still take great photos and allow you to swap out lenses. Before my E-P2, I had an E-PL3. If I were to buy a new camera now, I think I'd go with the – it even has a swiveling screen for selfies! I would suggest looking into the or — both great point-and-shoot cameras with pretty awesome zoom capabilities and photo quality. In the past year, I've decided to move away from backpack-only travel. In some cases, you don't NEED a backpack — and in some cases it's really nice not to have to carry all that weight on your back. I got a 60-liter pack earlier this year, and am a complete convert. Not only is the bag sturdy and roomy, but it has great wheels on it AND hidden backpack straps to be used in an emergency. I've been using it the past month in New Zealand, and it will be my new go-to travel bag for destinations where wheels won't be cumbersome. makes my favorite brand of packing cubes, and I have two sets of these to GIVE AWAY TO YOU, just in time for the holidays! Check out the bottom of this post for more info! For the past year or so, I've been traveling with a blue . It's a great travel bag for a lot of reasons — mostly because it's durable, has the perfect amount of pockets and space, and is kinda cute, too! Because why not? If you're going to take a anyway, why not make it a fun travel-themed one? When you travel a lot, having a good plug adaptor is key. I have a cheap all-in-one that works just about everywhere and doesn't have a ton of pieces and parts to worry about losing. Solid perfume sticks are perfect for the frequent traveler, because it means not having to worry about the liquids rule when flying — and, since they are usually smaller than a tube of chapstick, it's super easy to slip one into a purse or cosmetics bag. My brand of choice is — you can read a full review here! 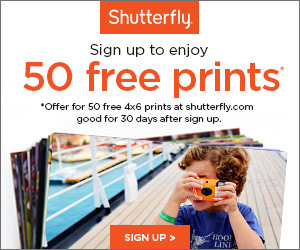 Shutterfly used to just be a website to use to print photos or make photo books, but today the site has tons of other options, from canvas prints to dinner plates to phone covers to customizable portable chargers (I SO want one of these!). A would be great for the traveler in your life who likes to remember their travels in a personalized way. Like I said earlier, I'm kind of a little bit obsessed with using packing cubes when I travel. Eagle Creek is my favorite brand, and they've given me two sets of their to give away to my readers! My wish list includes a underwater housing case for my Sony Action cam (along with a case for the camera and accessories) a new lens for my camera with a larger aperture range. Great list, Akatuki! I love that laundry bag, haha.